A. Prifitera, L.G. Weiss and D.H. Saklofske, The WISC-III in Context. R.W. Kamphaus, Intelligence Test Interpretation: Acting in the Absence of Evidence. S.S. Sparrow and S.T. Gurland, Assessment of Gifted Children with the WISC-II. J. Spruill, Assessment of Mental Retardation with the WISC-III. V.L. Schwean and D.H. Saklofske, WISC-III Assessment of Children with Attention Deficit/Hyperactivity Disorder. P.A. Teeter and R. Korducki, Assessment of Emotionally Disturbed Children with the WISC-III. B.P. Rourke, Significance of Verbal-Performance Discrepancies for Subtypes of Children with Learning Disabilities: Opportunities for the WISC-III. L. Phelps, Utility of the WISC-III for Children with Language Impairments. J.P. Braden and J.M. Hannah, Assessment of Hearing-Impaired and Deaf Children with the WISC-III. G.W. Hynd, M.J. Cohen, C.A. Riccio and J.M. Arceneaux, Neuropsychological Basis of Intelligence and the WISC-III. A.E. Puente and G.D. Salazar, Assessment of Minority and Culturally Diverse Children. B.E. Gridley and G.H. Roid, the Use of the WISC-III with Achievement Tests. T. Oakland and J. Glutting, Assessment of Test Behaviors with the WISC-III. Author Index. Subject Index. The WISC-III is the most frequently used IQ assessment technique in the United States. This book discusses the clinical use of the WISC-III with respect to specific clinical populations, and covers research findings on the validity and reliability of the test. It also includes standardization data from the Psychological Corporation. Many of the contributors participated in the development of the WISC-III and are in a unique position to discuss the clinical uses of this measure. The book describes the WISC-III from scientist-practitioner perspectives. It provides methods to aid in understanding and interpreting the WISC-III results for various groups of exceptional children. The book also presents detailed descriptions of behavior and achievement as well as recommendations for test interpreting standards. 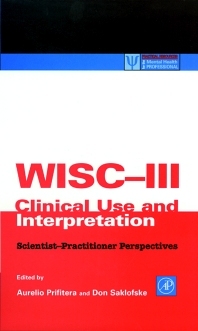 WISC-III Clinical Use and Interpretation has immediate and practical relevance to professionals who administer, interpret, or use the results of the WISC-III. The solid writing by leading experts makes the contents of this book an essential reference for WISC-III users. School psychologists, clinicians, and purchasers of WISC-III.